In an article published in the New York Times on March 8, 2014, Edward Wong discussed recent comments the Chinese Foreign Minister, Wang Yi. On March 8th, Mr. Wang made comments that reflected the regional tensions between China and Japan. Mr. Wang noted that there would be no compromise on the issues of territory or history, direct references to China’s territorial dispute with Japan in the South China Sea as well as Japanese Prime Minister Shinzo Abe’s recent visit to the Yusukuni Shine, which honors Japanese war dead including a number of war criminals from WWII. Additionally, Wong discusses Mr. Wang’s comments that China was seeking to engage in negotiations in order to resolve territorial disputes in the South China Sea, but that China would “never accept unreasonable demands from smaller countries.” Finally, the article touches upon China’s commitment build a new model of relations between the U.S. and China, rather than simply maintaining a competitive relationship. An excerpt from the article is contained below. Click here to read the full article. 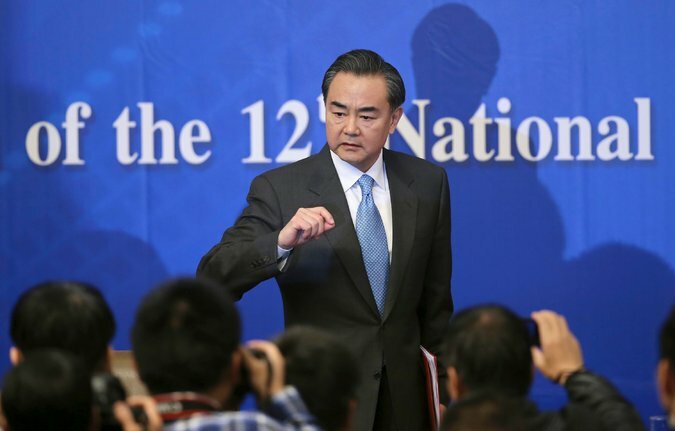 BEIJING — The Chinese foreign minister took a strong stand Saturday on China’s growing territorial disputes with neighboring nations, saying that “there is no room for compromise” with Japan and that China would “never accept unreasonable demands from smaller countries,” an apparent reference to Southeast Asian nations. The foreign minister, Wang Yi, a former ambassador to Japan, made his comments at a news conference on the fourth day of the National People’s Congress, an annual meeting of China’s rubber-stamp legislature. Mr. Wang took questions from foreign and Chinese news organizations on the same morning he learned that a Malaysia Airlines flight bound for Beijinghad disappeared, and he spoke on a range of subjects that included Ukraine, the Korean Peninsula and relations between China and the United States. Mr. Wang stressed several times that China was committed to regional peace. But Mr. Wang did not mince words on the subject of Japan and its prime minister, Shinzo Abe, who has angered Chinese leaders with recent public remarks on China-Japan relations and with a visit in December to the Yasukuni Shrine in Tokyo, where Japanese war dead are honored, including 14 Class A war criminals. In the East China Sea, China refuses to accept Japan’s administration of, or its claims to, islands that Japan calls the Senkaku and China calls the Diaoyu. Tensions between China and Japan have been playing out in diplomacy around the globe. In January, the Chinese ambassador to Britain and his Japanese counterpart both wrote op-ed articles for The Daily Telegraph in which they equated the other country to Lord Voldemort, the villain in the Harry Potter series. The two ambassadors even refused to sit at the same table during a televised BBC interview. Also in January, Mr. Abe told an audience at the Davos conference in Switzerland that the rivalry between China and Japan was similar to that between Germany and Britain before World War I, meaning their differences could supersede their close trade ties. In the South China Sea, China has been trying to stake sovereignty to islands and waters that are also claimed by Southeast Asian nations. Vietnam, the Philippines and Malaysia are among the opponents to China’s claims. The United States has said it takes no side on sovereignty issues but will maintain freedom of navigation. More recently, it has asserted that the so-called nine dashes map that some Chinese officials say defines China’s ambitious claims in the South China Sea violates international law because the territorial boundaries are not based on land features. “We will never bully smaller countries, yet we will never accept unreasonable demands from smaller countries,” he added.